Hoffman Estates Park District spells out sportsmanship. Have you ever watched a kid’s game and been totally embarrassed by another adult&apos;s antics? Or maybe you got caught up and were out of control? Some coaches will address the adults; some coaches are the guilty party. Most people agree that it has gotten out of hand. My son plays in a Saturday soccer league for fun. It is not a club or travel league, it is really just to play the game. The arena has the players on a surface below and the stands for viewing are above the field. A few weeks ago, an adult was perched over a railing hurling insults at the referee. It was incessant and unwarranted. At one point the on-looker said, "Where&apos;s the whistle?" The ref didn&apos;t look up, just raised his whistle in his hand and said, "Right here." You would think the heckling would have stopped. It didn&apos;t.
3. Parents should cheer for everyone. 5. You and your child do not play for the Blackhawks. If you don&apos;t understand this, please contact the ice dept. at (847) 781-3632. We would be happy to explain it to you. Jeff doesn’t take credit for the origins of this sign, he saw it at another venue, but his sign has caught the attention across the United States and in other countries. The Hoffman Estates Park District has an anti-bullying campaign and this is an extension of their policy. The sign was put up in September when there was a tournament with teams in the U.S.A. and Europe playing at the arena. However, last month pictures and news about this sign spread. There wasn’t anything out of the “norm” happening in Hoffman Estates. 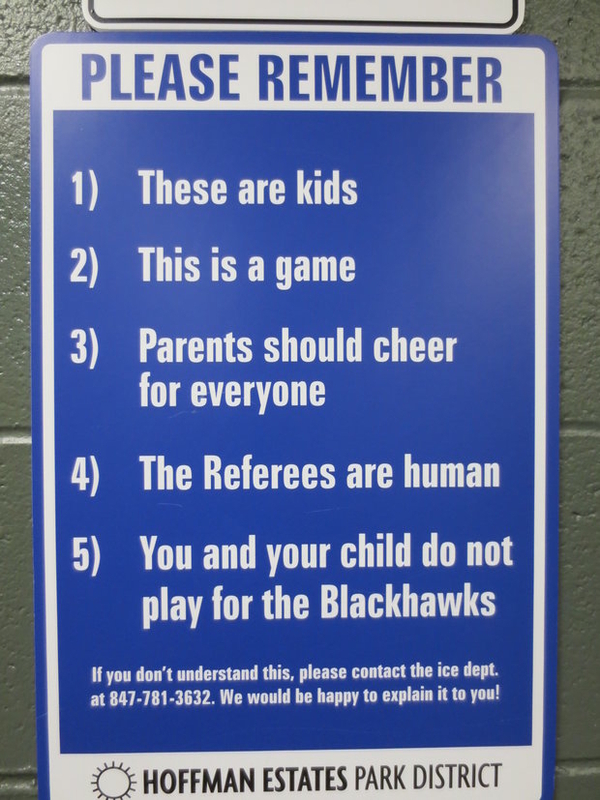 This sign must have resonated with other parents and leagues. They have contacted Doschadis throughout the US, Vancouver, Winnipeg, even London and New Zealand. Some want to copy the sign for their own use. Right now it is located at the two entrances to the ice rink. One line reminds everyone the kids are not the Blackhawks. In fact, the NHL has sent this information about the sign to all their teams, since they sponsor youth leagues. Jeff has received gratitude from officials of the Illinois Youth Hockey League, mainly for sticking up for the referees. Doschadis pointed out that most of the refs are just kids themselves, ranging from 14-16 years old. They have a lot to deal with officiating a game, let alone a belligerent parent or player. “Anything that would allow a parent, kid, official a moment of clarity at a youth (and high school) event and remember why they are there,” he said.